Feline Asthma is a pulmonary disease that causes coughing, lung irritation and difficulty breathing during flare ups. Asthma is essentially inflammation of the lungs due to allergies. A type of asthma called Heartworm Associated Respiratory Disease (H.A.R.D.) is caused by immature heartworms dying off inside the cat’s lungs. The symptoms and the treatment for both, Asthma and H.A.R.D., are very much alike. Symptoms include coughing, wheezing and quite possibly, a hard time breathing; blue gums from lack of oxygen and sleeping in unusual, out of the way places. 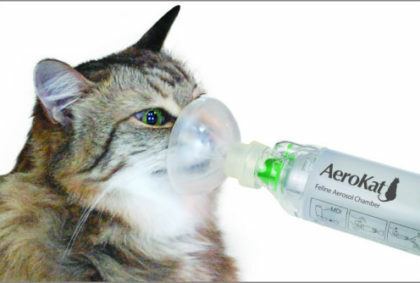 It is estimated that nearly 1% of all cat’s worldwide are affected by feline asthma. Glucocorticoids are usually prescribed to help keep inflammation under control, and you will be given a bronchodilator for future (difficulty breathing) episodes. Should your cat experience difficulty breathing during a vet appointment, expect them to be placed on oxygen until they are breathing normally. These methods will merely manage the symptoms to some degree, as there is currently no cure. The downfall to traditional treatment methods are the many unwanted side effects from the medication and the (possible) difficulty with medicating the cat. Stem cells “reset” the cat’s immune system. By injecting stem cells intravenously, your pet’s immune system will no longer be bothered by these same allergens.